MIG welder complete with Euro torch connection, 3m MB 15 torch and earth lead. - ideal for bodywork up to thicker materials of around 8mm we can supply this kit with a variety of torches. 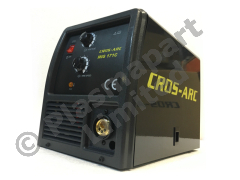 Supplied with a 1 year UK warranty as standard - The machine is CE Certified. This machine will weld all ferrous materials along with stainless and aluminium. The machine is very efficient and is powered by a large conventional transformer - it is built to last. There is full infinite output control which is extremely unusual for a machine of this size - the power source is force cooled. Welding output is infinitely variable, and the unit is electronically protected from overload as well as short circuit etc etc. The machine is fitted with a MB15 torch with a full ergo moulded handle and dust-proofed switch. Also included are the earth lead and full instructions. Each machine is supplied with a full instruction manual.